The seventh installment of the "Fast and the Furious" series, "Furious 7," is beating even the most optimistic projections for its opening weekend at the box office. Analysts are now saying it could make $150 million throughout North America by Sunday night. A week ago, they were predicting $115 to $125 million for this weekend -- and even those projections were turning heads in Hollywood. Then, after seeing some of Friday's results, the projections nudged up to $130 to $140 million. On Saturday morning, expectations soared even higher, thanks to sellout crowds at some theaters on Friday night. $148 to $150 million now looks likely. The film is having the biggest opening of 2015 to date, easily overtaking February's $85 million opening of "Fifty Shades of Grey." It's also driving right past last year's $95 million opening of "Captain America: The Winter Soldier" -- which was, until now, April's biggest opening in movie history. "Furious 7," starring Vin Diesel and Dwayne "The Rock" Johnson, marks the unofficial start of the summer movie season. The film franchise has been hugely popular for over a decade. Its loyal following has helped it make $2.4 billion worldwide since 2001. This time around, there's even more interest, partly because the seventh film is the last to include the actor Paul Walker. Walker died in a 2013 car crash while the film production was still taking place. The film is being released by Universal, a division of NBCUniversal. Coincidentally, February's "Fifty Shades of Grey" was also a Universal picture. 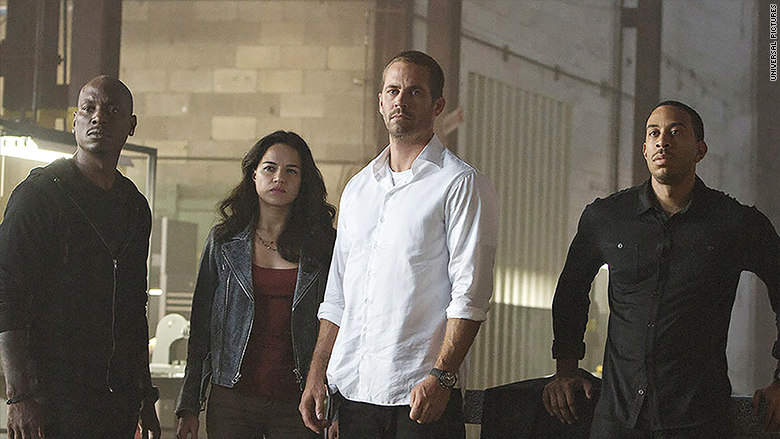 Industry estimates indicate that "Furious 7" made about $16 million during special Thursday night showings. Universal will wait to publicly celebrate until sometime Saturday or Sunday. The studio is officially projecting $149.5 million, just slightly below the $150 million mark. No matter what the final total, it's clear that "Furious 7" will become the biggest opening in "Fast" series history, passing the $97.3 million "Fast & Furious 6" launch in May 2013. The first film in the series made $144 million overall, not adjusting for inflation. No. 7 is likely to beat that figure in its first weekend. "Furious 7" will also set the template for what Hollywood hopes will be a hot season after last year's dismal U.S. summer box office.